This is a brand new top and skirt combination. 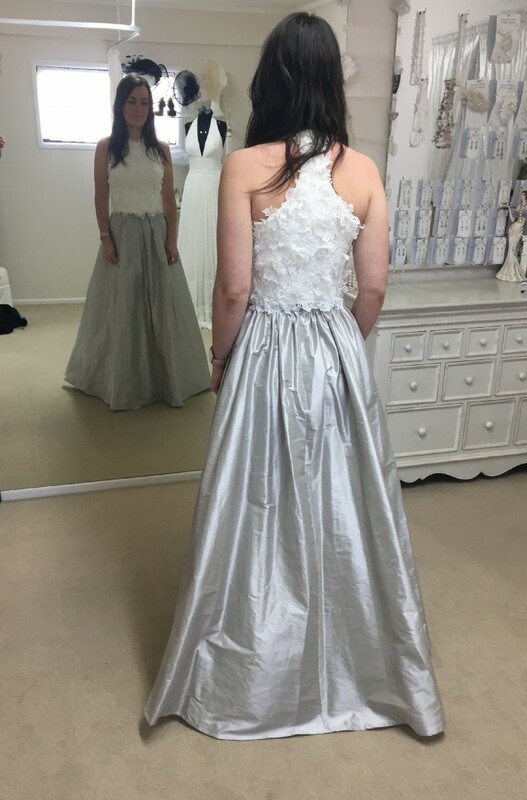 Never worn (other than tried on) as I bought it too early before my wedding and unfortunately changed my mind. Top: Custom made by Corina Snow. Heavy textured lace. “Racer back” style back and high front. Skirt: Juliette Hogan Dior Skirt. This was altered ever so slightly. Off the rack it has thin a black leather waist band, this was removed and covered with material taken from the hem of the skirt. It was bought as a size 12 skirt and taken in to a ten. I am a standard size ten in this photo and am 174cm tall and NOT wearing heels. If you live in the BOP area I am happy for you to try on.